Sprint has announced that the Android-powered Motorola Admiral is arriving with its direct connect capabilities on October 23 for $99.99 with a new two-year activation or a qualified two-year upgrade. 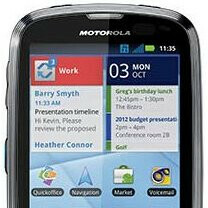 The Motorola Admiral is a slab-style device that features a full QWERTY keyboard below the screen. The display itself measures in at 3.1-inches and has a resolution of 480x640. The Android Gingerbread device is powered by a single-core 1.2GHz processor and has a 5 megapixel camera that can record video in 720p HD. The Admiral is the follow-up device to the previously offered Motorola XPRT. In addition to it featuring Sprint’s Direct Connect service, it is also a rugged smartphone with its 810G mil-spec design. This should make the Admiral an attractive device for anybody who is rough on their phones. You can pick up the Motorola Admiral for $99.99 on October 23. The price of course is with a two-year agreement and is after a $50 mail-in-rebate. Tell us what you think about the rugged Motorola Admiral. 480x640 resolution? Never heard that one before. And probably for good reason. Their trying to do away with Nextel network so I am not sure if they would release a new nextel if they are fading it out. its on sprints new cdma direct connect netowrk, iden is going away... forever! It is a Sprint phone, though if you think about it, people who like feature phones with a querty keyboard (and they are a loot), would find this very attractive. Its not like i would get the device, since i like really high end phones, but the fact that this has a 1.2 GHZ processor and such a small screen will mean that it will be incredibly fast! Feature phones, excluding the small amount of things you can do with them, are fast and do not lag since they dont have multitasking or good apps, and this phone will do the same thing as a feature phone, with all the benefits and more. Just thing about it, either a LG rumour touch or a motorola admiral. Which one would you choose? or evo shift or samsung epic?